Mohylnytsky, Antin [Могильницький, Антін; Mohyl’nyc’kyj; also Любич-Могильницький; Liubych-Mohylnytsky], b 3 March 1811 in Pidhirtsi, near Kalush, Stryi circle, Galicia, d 13 August 1873 (buried in Yablinka, Nadvirna county, Galicia). Romantic poet and civic figure. 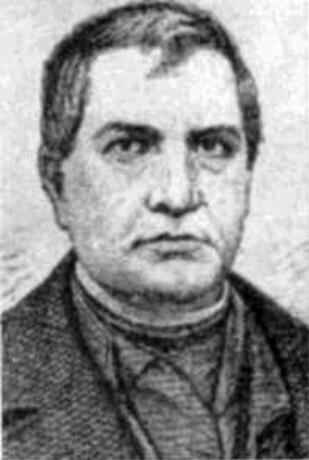 He graduated from the Greek Catholic Theological Seminary in Lviv (1840), was ordained, and served from 1841 as a priest and teacher in the villages of Khitar, Zbora, Komariv (1845–59), and Babche (from 1859). Inspired by the Ruthenian Triad, especially Markiian Shashkevych and his friend Yakiv Holovatsky, Mohylnytsky published several poems in the Galician vernacular, including ‘Ridna mova’ (Native Language, 1839), ‘Zhadka staryny’ (Memory of Antiquity, 1939), ‘Uchenym chlenam Rus'koï Matytsi’ (To the Learned Members of [the] Halytsko-Ruska Matytsia [society], 1849), and other patriotic poems about the Ukrainian language; the ballad ‘Rusyn-voiak’ (Ruthenian Soldier, 1849), about the trials and tribulations of Ukrainian military recruits in the Austrian army on the Italian front; and the first Western Ukrainian epic, the unfinished ‘Skyt Maniavs'kyi’ (Maniava Hermitage, 1854), based on folk legends. His 1839 seminary address titled ‘Obligations of Subjects’ appeared in Vinok rusynam na obzhynky (1847). During the Revolution of 1848–9 in the Habsburg monarchy Mohylnytsky favored Ukrainian-Polish co-operation. In 1861 he was elected to the Galician Diet and was a delegate to the State Council in Vienna, where he spoke out for the equality of Ukrainians with the other Slavic peoples in Austria-Hungary. From 1864 he was persecuted by secular and church authorities, and in 1866 he left politics. Editions of his works were published in Lviv in 1885, 1906 (along with works by M. Shashkevych, Ya. Holovatsky, and Mykola Ustyianovych), and 1913 (with works by Ustyianovych). Mohylnytsky’s biography, by Kostiantyn Luchakivsky, appeared in 1887, and an analysis of his life and works by Vasyl Lev was published in Olexa Horbach’s festschrift in 1983.